Comicbook. A4 size, Full Colour cover on 250gsm glossy stock, 24 full colour interior pages on 150gsm glossy stock. 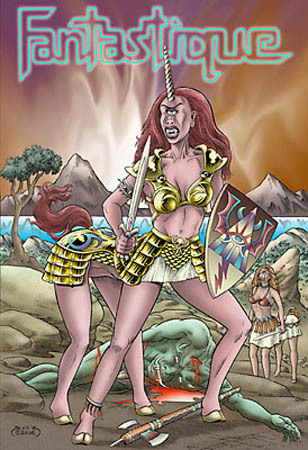 Comprising 3 stories entitled "Cosmic Astral Vamps", Femme Feralis" and "World Before the Flood - The Battle of Sovyone", Fantastique #1 is a collection of surreal sci-fantasy stories and includes an introduction by David de Vries. and Pinups is now available here!